A low maintenance solution for an indoor and outdoor waste management receptacle ideally suited for office buildings, shopping malls, and convenience stores. 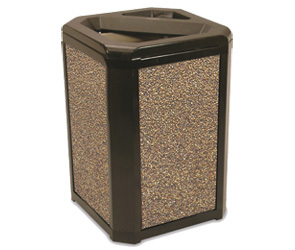 These 20 gallon waste receptacles are engineered for superior durability and a reassuring permanence. Featuring a solid resin constructed Top, Base & Frame Kit that resists fading, won't leave rust stains, and is impervious to dents. The stay open strap and hinged hood provides easy access to the rigid leak-proof plastic liner. Ash Urn sand is available for the Ash/Trash Kit.